Book Review- Alexander McCall Smith's Espresso Tales — Always Packed for Adventure! Thankfully, Alexander McCall Smith has a huge fan base. 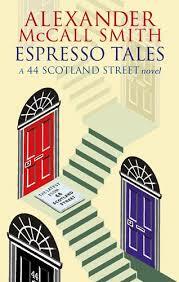 A huge fan base that convinced him to continue with the 44 Scotland Street series beyond his second collection, Espresso Tales. I cannot imagine him abandoning such a colorful group of characters, but as he mentions in his forward, he had intended Espresso Tales to be the end of the series and it would have been, had not friends and fans convinced him otherwise at a publication party. Although, I would argue that his intention of ending the series it is what made these stories especially sweet. In particular, the story of Bertie and his overbearing mother, Irene, had a heartwarming resolution, that might have not come, if Smith hadn't aimed to end the series. Irene was so tyrannical and irrational in the first book and the first half of this book, that it would have been cumbersome to have her character continue in the same direction. By the end of Espresso Tales, she is beginning to see the damage that she has been inflicting on her family and although it's not a total transformation, it is a believable one. The real hero of the story is Irene's husband, Stewart, who finally puts his foot down and confronts his wife. Another stand-out is the relationship developments between Matthew and his father Gordon. In Espresso Tales, the prickly relationship finally has resolution when the two men have a chance to really engage in an honest conversation. Smith has a knack for writing well-rounded characters and for making the reader empathize with even the most difficult personalities. This is one of the reasons that I love his No. #1 Ladies Detective Series. He writes sweet stories that manage to never be trite or belittle the readers intelligence. He is a keen observer of life and has a unique way of expressing it through his stories. I look forward to reading the further adventures of the residents living at 44 Scotland Street in his already published follow-up, Love Over Scotland. Lucky for me, I just discovered this series last year and I'm seven books behind! It's a book lover's dream!